The developers typically deal with both GAP and GATT layers when implementing their applications. The GAP layer defines several roles the Bluetooth LE end-device will be classified as. The GATT layer defines profiles, which is organized set of data and services the end-device will support. Through these layers, each BLE device can not only be identified, but its characteristics and attributes can be determined by other nodes wanting to pair against it. The lower layers of the protocol stack is both a combination of hardware implementation and software enforced interface. New GATT profile specifications are being proposed and adopted by the members of Bluetooth SIG. These specifications provide guidelines across wide range of end-user applications and scenarios. A complete list of these profiles can be found here. In order to draw a parallel against the internet world, the GAP can be thought of as a type of application protocol such as FTP, HTTP, SSH. Furthermore, once an application has been classified as HTTP, it would support protocol specific commands such as GET or POST requests, among others. These protocol-specific set of functions and data can be thought of as GATT in the BLE world. 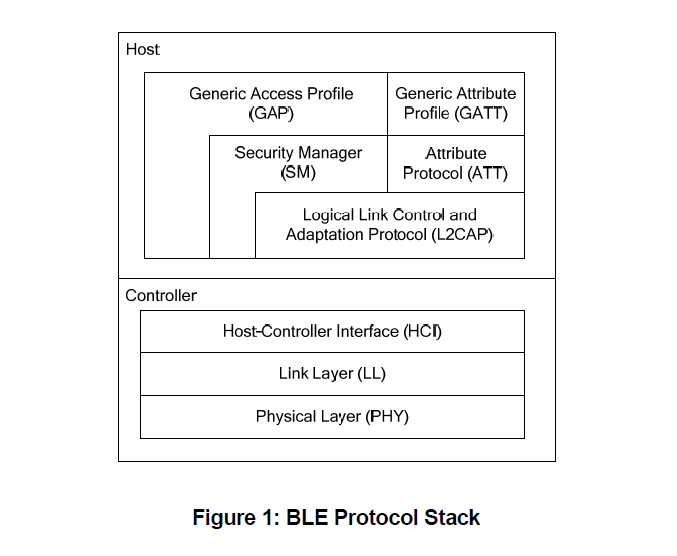 For more detailed description of the BLE protocol stack, this document from TI can be very useful in understanding the basic concepts. Texas Instrument provides a complete development tool kit for CC2540. Here’s the low down.